They worked in secret, late at night, in dimly-lit basements. With little more than typewriters to work with, the underground scribes toiled to translate the manifestos of their struggle - words so potent that they could destroy one of the most dominant empires in history. Such was the power of Exodus, Leon Uris's fictional account of Israel's birth, to a small group of Jews in the Soviet Union. They passed chapters of the book to trusted comrades, along with samizdat - self-published, covertly distributed essays - that fed each other's hunger for Israel and anything Jewish. Much of the literature that the Communist Party considered dangerous and worthy of lengthy prison sentences - Hebrew lessons, Purim plays, translations of "Hatikva" and "Jerusalem of Gold" and petitions to allow free immigration to Israel - sits in the archives of Beth Hatefutsoth (the Nahum Goldmann Museum of the Jewish Diaspora), on the campus of Tel Aviv University. Until now they have lain dormant, yellowing in silence as Israel busied itself with quelling intifadas and launching hi-tech companies. This week, though, 40 years after Israel's victory in the Six Day War gave Soviet Jewish protesters the momentum they needed to open the gates of freedom, the museum opened an exhibit on the movement that toppled the communist regime and energized Zion. THE STOREROOMS of the museum are filled with mementos of that era. A cigarette lighter, emblazoned with the flag of Israel, which plays the national anthem. The Hebrew ulpan recordings of Yaakov Suslensky, considered revolutionary material, stored in cardboard boxes handcrafted by Moldovan KGB agents. The coat that Natan Sharansky wore on his famous walk to freedom across East Germany's Glienicke Bridge after more than a decade of Siberian exile. A postcard written by an inspiring ulpan student: "Dear Saraleh, Here is a souvenir for you. It is a photo of my first prison in Leningrad." Together, these items begin to tell the story of thousands of Jews who risked their freedom for the right to live in the Jewish state, who threatened the Kremlin not with guns but with placards reading, "Let my people go!" They begin to tell the story, that is, but they cannot provide the fullness of such a tale. Take, for example, Yosef Begun's Hanukka in a Moscow prison in 1971. It was the first time Begun would be locked up, but not his last: By the time he was allowed to leave for Israel in 1988, Begun would have spent 10 years in Soviet jails. In this case, his "crime" was helping some 20 Jewish intellectuals organize a public hunger strike to protest the government's restrictions on aliya. Begun and his fellow inmates, nearly two dozen other Jewish "criminals," rallied each other through the bitter conditions with the reminder that the holiday of Hanukka was upon them. With the more learned among them regaling the others with stories of the Maccabees' triumph over their far stronger, more numerous enemy - and with a clever ruse from one of the group allowing them to improvise a set of candles to light - the men celebrated as if they were joined by all their brethren at a fancy holiday feast. In a way, they were. A deep sense of connection to the Jewish people, as well as an abiding spirit, helped the persecuted heroes of the movement through such hard times. "Even while we were in Soviet prisons," Begun told The Jerusalem Post this week, "we felt like Israeli citizens." THERE WOULD be numerous injustices against men like Boris Kochubiyevsky, who was sentenced to three years in jail for, essentially, having the audacity to proclaim in open court that "Jews are oppressed here." So, too, there would be outrageous acts such as the plan by a group of refuseniks to hijack a small plane to draw attention to their plight. But most of those who participated in the struggle against Soviet anti-Semitism were people, like Aba Taratuta, who simply wanted to pack up and leave. "In Riga," Taratuta recalled, "all the Jews talked about was aliya. They would see each other in the street and say, '9-2.' Anywhere else, you'd assume they were talking about soccer scores. With them, however, it was the number of aliya refusals versus authorizations doled out by the authorities." In those days - when, after the Soviet Union severed ties with Israel following the Six Day War, the government led a campaign of anti-Zionist propaganda - few of the country's 3 million Jews had an accurate picture of what life in Israel was like. But, Taratuta said, they didn't need one. "It wasn't so important what we knew about Israel. The bottom line was, we realized that Russia was not our country." When that realization sank in for Taratuta, in 1973, he had just received his Ph.D. in astronomy after working 15 years in a sensitive munitions factory. Simply for filing an immigration request with OVIR, the ministry that threw obstacle after obstacle in the way of Jews intent on aliya, Taratuta had to leave his job. He would become a truck driver, then an elevator mechanic and, finally, part of a crew of refuseniks who maintained the heating system at a public bath. While Taratuta and his family waited 15 years for an exit visa, Americans came to offer support. KGB agents would come and confiscate the guest books they signed, but the blue jeans the Americans brought made Taratuta's son one of the most popular kids in school. THE ROLE played by foreigners, especially Americans and Israelis, in making the refusenik issue an international story, was significant. 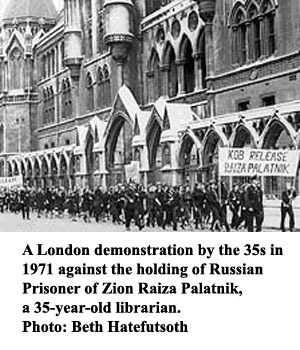 In the United States, Jewish organizations lobbied for pressure on the Kremlin, with the smuggled samizdat of the persecuted bearing witness to the cruelty of the Soviets. Congress passed a law enacting trade sanctions on countries that restrict emigration rights. A massive rally in Washington in 1987, as Ronald Reagan was meeting with Mikhail Gorbachev, embarrassed the Soviet regime into allowing more Jews to leave. Israel was active, of course, demanding that Jews be given the freedom to settle in the Holy Land, working with Jewish groups abroad and sending delegations to the Soviet Union to help inculcate Zionism and Jewish culture. "The Soviets always suspected that Israel was behind the refuseniks," said Zvi Magen, a former colonel in IDF Intelligence who served as ambassador to Ukraine and Russia in the 1990s and early 2000s. Magen also served as head of the Liaison Bureau, codenamed Nativ, which encouraged Soviet Jews to develop their Jewish identities and to continue their pro-aliya activism. Currently he serves as director of the Institute for Eurasian Studies at the Interdisciplinary Center in Herzliya. On more than one occasion, the Kremlin has accused Nativ of being a thinly-veiled Israeli spy ring. That's not exactly accurate, Magen said. "The members of Nativ are like soldiers, in the sense that they serve their country abroad. What they do is not spying, but what is called 'influence building.' Everyone does it," Magen said. "It's like the Alliance Francaise or the Goethe Institute... If you ask them who they are, who they work for, you won't get a straight answer. What do they do? Encourage French or German culture..."
In most cases, "encouraging culture" is innocuous. In other cases, though... "[Vladimir] Putin once said something to me," Magen said, "about his time in Dresden" - a murky period in the Russian president's KGB career in which he was in charge of a Russian cultural outpost in Germany - "to the effect that this sort of thing is worse than spying." 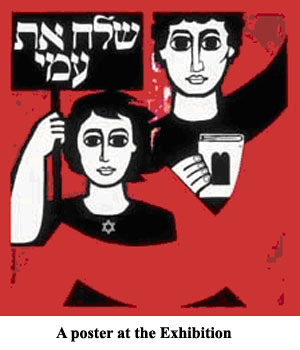 In the case of Soviet Jews challenging a government singularly dedicated to crushing independence, the "cultural" work of the refusenik movement took on immense importance, and ultimately became a factor in the collapse of the Soviet Union. "No one, not even the famous dissidents, was purely interested in human rights," admitted Begun. "Overturning the regime was part of our desire - but people who openly worked for such a thing were executed. So we focused on aliya, and on the right to practice Jewish culture." "Natan Sharansky believes in human rights much more than I do," said Magen. "From a certain perspective, 'human rights' is a weapon." It is possible to understand, then, why the authorities could view "Hatikva" as a threat. "The Soviets always saw their Jews as agents of the Zionists, and Israel as an agent of Soviet Jews," Magen explained. "To them, no matter how assimilated a Jew may be, he was like a 'sleeper agent' capable of turning against the regime." TENS OF thousands of Jews poured out of the Soviet Union in the 1970s and '80s, with more than 1 million of them reaching Israel. Arrival here was not always a fairy-tale ending for the refuseniks and Prisoners of Zion, however. For every success story like that of Eduard Kuznetsov, one of the hijacking plotters who established Israel's largest Russian-language newspaper, or Yuli Edelstein, who went on to a career in the Knesset, there were others who never truly found their "Jerusalem of Gold." Some left long ago for the US or Canada, Taratuta noted, while some even went back to Russia. "The ones who were idealistic, who thought that Russia was entirely bad and that Israel was entirely good," he said, "they were pretty disappointed." Not long after he arrived here in 1988, Taratuta found work at the Technion in Haifa - not as a truck driver, nor as a mechanic, but as a scientist. He would teach there, at the space research institute, until his retirement a few years ago. In 2001, fearing that the stories of the Jewish dissidents would soon become lost, he helped found Save and Remember. The archive of interviews and other material was the starting place for the Diaspora Museum exhibit. Taratuta still has friends in Russia with whom he is in regular contact. Aliya, however, is not part of their discussions. "I don't try to convince Jews in Russia to make aliya," said the straightforward Taratuta. "If they have spent their entire lives in Russia and still don't understand where they are... well, I'm not going to be the one to tell them." There are also huge numbers of Jews living in Israel today who are here, in large part, because of the sacrifices and suffering of people like Begun. He's not sore, however, about the lack of recognition he feels from this community. "I understand," he said, "that people were afraid of getting into trouble, of losing their jobs, if they supported us. Also, there was a lot of assimilation. A lot of Russian Jews weren't very interested in Israel... Some didn't know much about Israel, some just didn't care to know much about Israel." Now, said Begun, who recently completed a one-hour-long movie about his life and the dissident movement, he is happy those assimilated Jews were able to come to Israel. "That's what we were fighting for in the first place - the Jews who were so assimilated that they didn't know why to care about their homeland. When I was arrested and sent to exile," Begun noted, "it was because I was exposed, because I was distributing my materials, not to refuseniks, but to the rest of the Jews. Because I tried to reach out." Now well into his 70s, Begun is still reaching out. Since making aliya he has worked in Jewish education, both here and on trips to Russia, trying to interest Jewish youths in their culture and heritage. He has a granddaughter, currently serving in the IDF, who used to bring him to her school so that her classmates could hear his story. That, Taratuta complained, was an all-too-rare occurrence. Taratuta's son, whose childhood was marred by the hardships of refusenik life, has little interest in discussing that period of his life. Taratuta's grandchildren, though, do want to learn about that chapter in Jewish history - and Taratuta fears that they, along with the rest of Israeli children, will not have that opportunity. "Why is there no program to teach schoolchildren about our struggle?" he asked. "Why are our children not introduced to the people behind the story? Where's the public's interest in us and our fight, when everyone is complaining about the death of Zionism?!" Indeed, the Diaspora Museum exhibit is meant to provide a remedy for this and other problems. Part of the motivation for the exhibit is not just to bring the struggle of the Prisoners of Zion and the refuseniks to the attention of veteran Israelis, for many of whom the thrill of rescuing Soviet Jewry has faded into an outright disdain for Russian immigrants, but to inform the children of those immigrants as well. There's a young Russian woman who works here at the museum," said Rachel Schnold, the exhibit curator, "who didn't know any of this history. She's not alone, of course. And a lot of what Russian olim do know of the struggle is only the version that the Soviets propagated. We have to change that." As Begun lamented: "At the time, our names were in the news all over the world. We were written about every day. Today, though, you'd be hard pressed to find someone in the street who could name a Prisoner of Zion, other than Sharansky. People don't know the whole story - which is a shame, because it's a very important story."